Gently removes make-up & daily impurities. With argan oil & soothing rose otto. Leaves skin cleansed & hydrated. Perfect for mature & sensitive skin. Fragrance free.Argan+ Skincare blends precious Moroccan Argan Oil with wonder oils and effective anti-ageing ingredients to deliver beautiful results. With regular use, skin is left feeling hydrated, revealing a fresher and younger looking complexion. Rejuvenating Micellar Water helps to delicately cleanse, moisturise and remove make-up and daily impurities in one gentle step. Organic Aloe Vera blends with Rose Otto Oil, known for its rejuvenating and balancing benefits, to soothe and awaken skin with no tight or greasy feeling. Skin is left clean and feeling refreshed. Derma tested. Argan+ Synergy Argan+ Synergy is an all-natural 100% blend of precious Moroccan Argan Oil with 4 other amazing oils: Baobab,Kukui, Moringa and Sacha Inchi, all selected for their restorative, regenerating and nourishing properties. 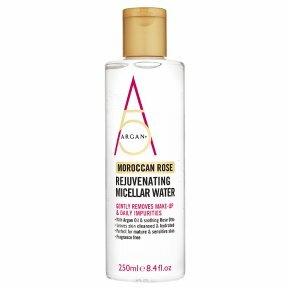 Directions for Use: Apply a small amount of micellar water onto a cotton pad and wipe carefully over the face, neck and décolleté. No need to rinse. Repeat until all the pads comeaway clean. Use every morning and evening. For external use only. Should irritation occur, rinse well and discontinue use. Avoid direct contact with eyes. If product gets into the eyes, rinse well with water immediately. Due to natural oils, product colour may vary. Do not use on areas of broken or damaged skin.